Back in April, when Asus announced their VG23AH passive 3D monitor with IPS panel I was quite interested in the product and now, a bit later I’ve got the chance to do some testing with a sample unit that I got from Asus for this review. I’m assuming that you already know what are the differences between an active and a passive 3D solution, so I will not be comparing the two technologies here, but instead will focus on the features and performance of the Asus display in question. The 23-inch Asus VG23AH 3D monitor uses passive 3D technology (FPR 3D) on top of an IPS LCD panel, it features HDMI 1.4 interface with support for frame packaged content as well as Side by Side and Over/Under and there is also a built-in 2D to 3D conversion functionality. 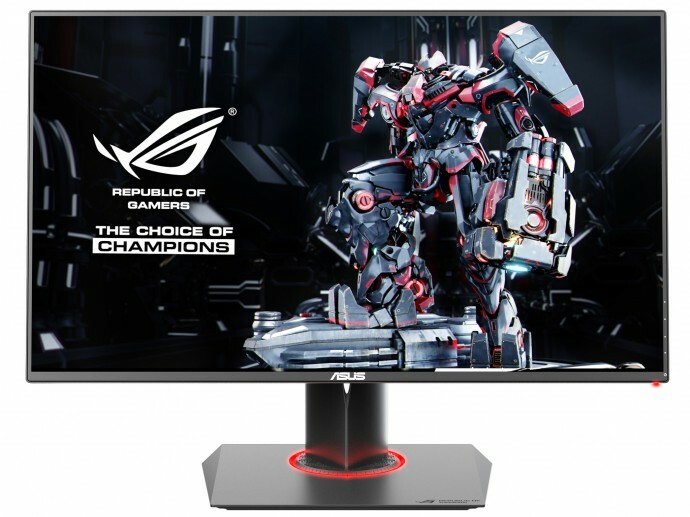 What is more interesting, especially for stereo 3D gamers is the fact that Asus does not bundle this 3D monitor with any kind of stereoscopic 3D solution for transforming 3D games into stereo 3D ones. 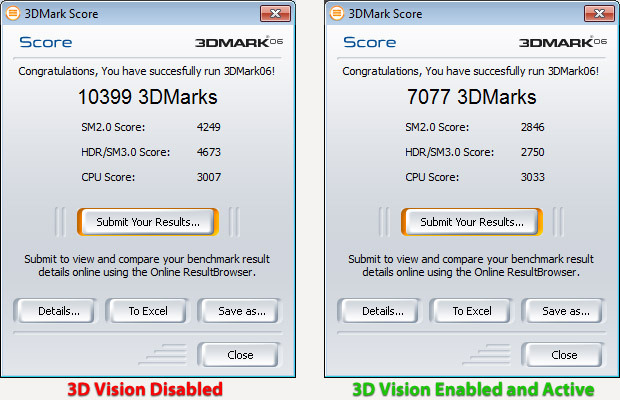 This is neither an “Optimized for GeForce” product, not it comes with the TriDef 3D software or the iZ3D Driver, however the good news is you can use pretty much any product that provides you with Row Interleaved output together with the monitor to output in 3D. 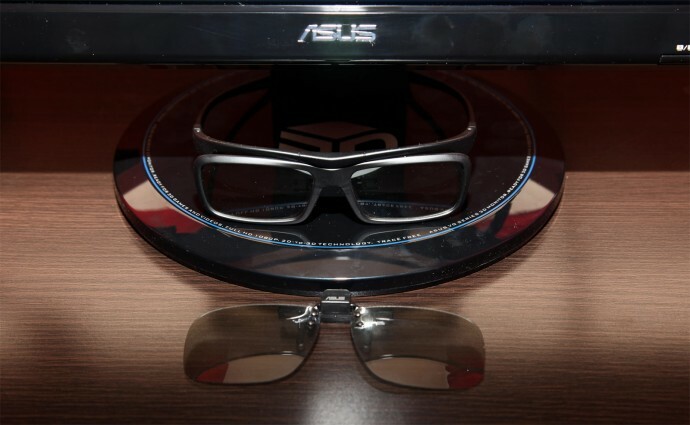 The Asus VG23AH monitor comes bundled with two pairs of passive 3D glasses – one normal and one clip-on for use with prescription glasses. This is a typical configuration for passive 3D monitors and the good news is that the monitor is compatible with pretty much any RealD-compatible passive 3D pair of glasses, these can be found really cheap, but you can also use them together with a better quality, more comfortable and nicer looking while still affordable glasses such as the ones made by Oskav that I’ve also tested the display with and they work perfectly fine. There are of course much more expensive designer passive 3D glasses available, but going for such is a bit more of a personal preference, I probably am not going to spend a three number figure for passive 3D glasses, unless I really like the design a LOT. With that said, the standard glasses that Asus bundled with the display are quite OK, but they were a bit small for me personally and the larger Oskav glasses (both the frame and the lenses) that I’ve had handy were more comfortable for use with the display. The clip-on glasses were OK, but I prefer to wear normal glasses on top of my prescription glasses when using stereo 3D monitor than to use clip-on glasses, again this is more a matter of personal preference. 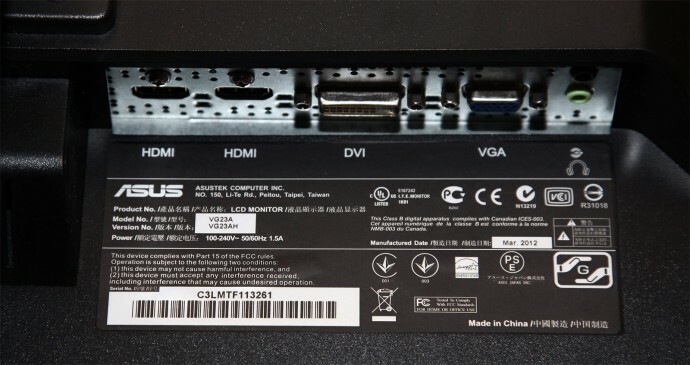 The monitor comes with two HDMI 1.4 connectors that support 3D as well as with a single DVI and single VGA connectors and there are some things that you should know when using these different video interfaces, especially regarding the viewing of stereo 3D content. Officially only the HDMI 1.4 interfaces support stereo 3D since the monitor does not come with a software solution to allow you to output any kind of stereoscopic 3D content, but since this is a traditional passive 3D display you can use most of the stereoscopic 3D software configured to output in Row Interleaved mode. There are some functions however that will only work with the HDMI interface for example the manual switching capability to Side by Side or Over/Under mode from the monitor’s menu is only active when using the HDMI interface. The built-in 2D to 3D autoconversion functionality is available for all interfaces and it does quite a decent job, although I won’t recommend it over any software that supports stereoscopic 3D output or a video that has a 3D version. You can also control the level of simulated depth when using the 2D to 3D conversion feature, something that is good to play with if you are getting more ghosting if you increase the strength of the simulated effect more. 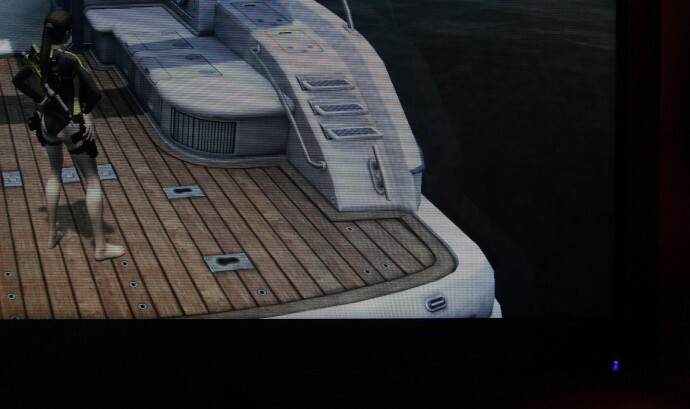 And a bit more on the levels of ghosting that the VG23AH provides you with in a bit. 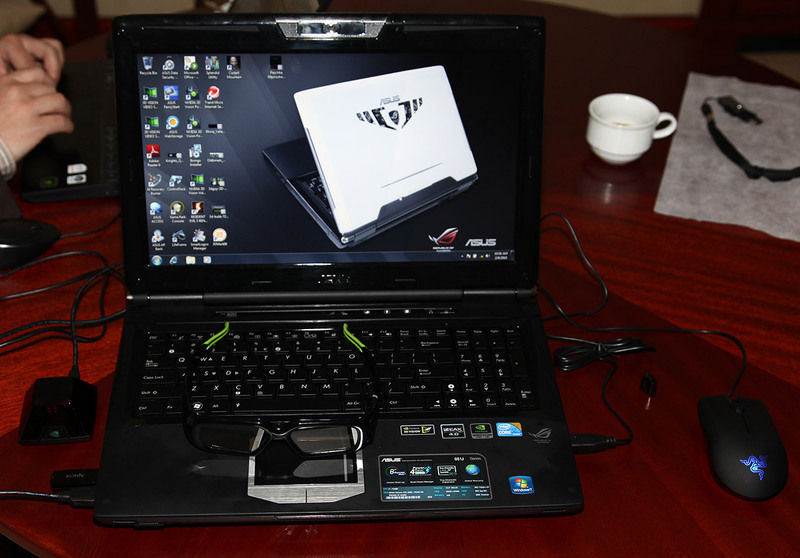 If you’ve seen the active 3D model VG236HE from Asus that was released back in 2010 you may notice quite a few similarities between it and the VG23AH, at least in terms of the external appearance of the two products. 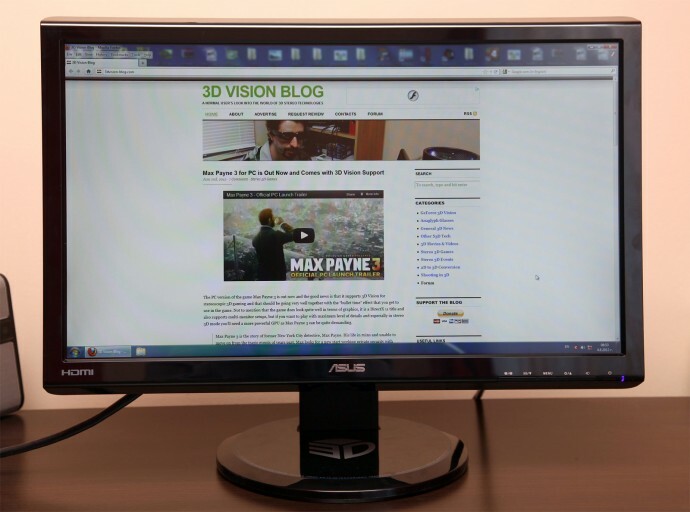 Of course being able to review the Asus VG236HE 3D monitor I’ll have to compare it to this one in terms of performance and the good news is that the new model performs better in terms of stereoscopic 3D quality compared to the older active 3D solution. That of course does not necessarily make it the better choice and if it did not perform better I’d personally be disappointed, especially since there is quite a big time difference between the release of the two products. One of the things that I was not too happy when the VG236HE was released was the glossy display that it used, now that drawback has been improved significantly with the VG23AH, it is still a glossy display, but with much better coating that behaves almost like a matte display than a glossy one. Considering the fact that we have an IPS LCD panel used in the Asus VG23AH it is normal to expect good out of the box results in terms of color reproduction, however the factory settings disappoint a bit. The most likely reason for that is that Asus wanted to really keep up to their specs and provide really high brightness – the one they list in the specs is covered. It is hard to say anything about the incredibly high dynamic contrast ratio that Asus claims for this monitor, however at the factory settings I’ve measured around 0.29 cd/m2 black point with 855:1 contrast ratio. Calibrating the monitor does bring really good results with very little brightness loss, still over 200 cd/m2. 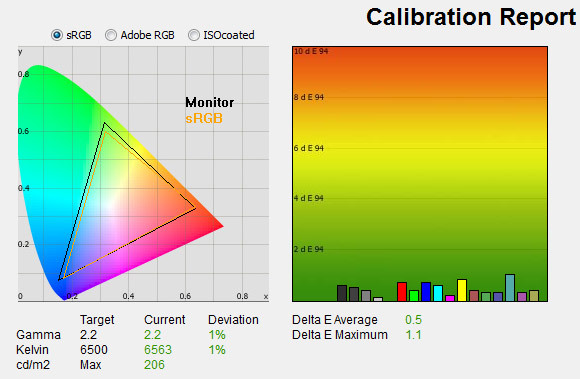 The color accuracy after calibration is what you’d expect from an IPS panel, but the funny thing actually is that the latest generation of 120Hz TN panels such as the one used in the Asus VG278H active 3D monitor does provide just slightly worse results after calibration. This just means that TN LCDs are starting to catch up to IPS at least in color accuracy, although they are still behind in terms of the width of the viewing angles, on the other hand you can say that IPS is also catching up in terms of response time and getting close to what TN can do. After the calibration the black point of the monitor remains at pretty much the same level, but due to the decrease of the total brightness level you can expect that the contrast level will be lower. Don’t forget that this calibration is done in a way to achieve best results while retaining the highest brightness level possible, so at the cost of some more brightness you may also achieve better results if you need. Now, since I’ve mentioned the response time I’ll have to talk a bit more about it here as it is something important that may affect your experience using this monitor in stereo 3D mode. You should know that the response time of the pixels in a 3D display is a very important factor as if they are not fast enough you are going to be getting more of the so called crosstalk or ghosting. And while IPS is still not fast enough in terms of response time for 120Hz panels in active 3D monitors, it is quite Ok for use in the 60Hz passive 3D displays. With that said you should not expect perfect results on the Asus VG23AH with the stock settings as the Trace Free function of the display is set to 60 (this controls the level of overdrive used to improve the response time of the pixels) and this actually introduced quite a lot of crosstalk/ghosting with contrasting objects that are moving. So you’d want to lower the Trace Free value than the stock 60, going down to 20 makes things more acceptable and you may want to even go to 0. Time for some crosstalk/ghosting testing, starting with the extreme black and white test photos that I’m using to see how things look in close to worst case scenarios, though you’ll hardly get things so bad when using the display normally in stereo 3D mode. The moire effect you can see on the white in the photo is caused by the “interlacing” of the display when viewed trough one of the lenses of the glasses, when viewed normally you will not see this effect, so don’t be bothered by it. The situation with the white is really good and the black is also quite good and these are extreme case scenarios with really high contrasting objects on completely white or black. Here, as with other passive 3D solutions you should be aware that you should keep within a very narrow vertical viewing angle in order not to loose the stereoscopic 3D effect, otherwise the level of crosstalk may significantly increase to a state where you’ll completely loose the feeling of volume. The tests here were performed at a vertical viewing angle of zero, normally you should be OK within 5 to 7 degrees, but not more, so be careful when you setup a passive 3D monitor and don’t blame it if you are getting bad results just because you are not using it right. 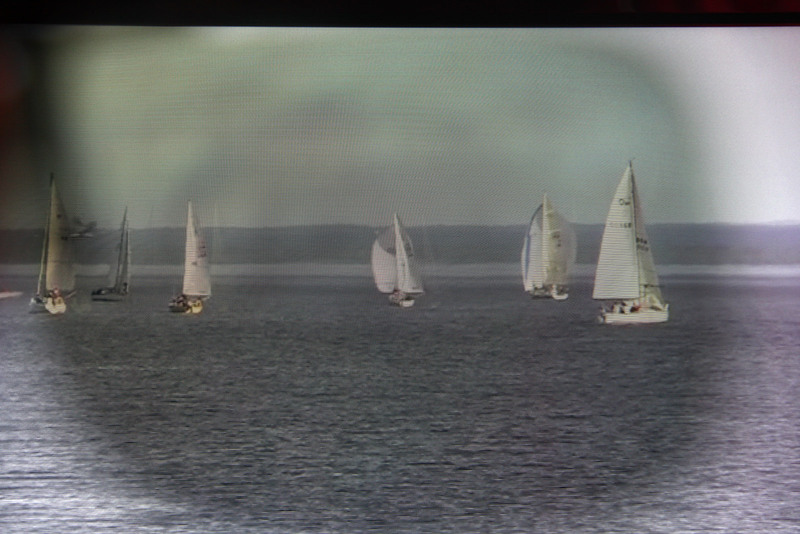 The sailboats 3D video test exposes just some faint and very hardly visible ghosting, so again very good performance here, although not perfect as there are some 3D displays that don’t show any crosstalk at all on this test. And finally some real-world tests using the game Tomb Raider Underworld in stereoscopic 3D mode, a good example to show that the Asus VG23AH does indeed have just a little crosstalk and performs very well in stereoscopic 3D mode. The top of the screen does not show any crosstalk at all if you lower the Trace Free, if you keep it at the default value of 60 you will see some afterimage. 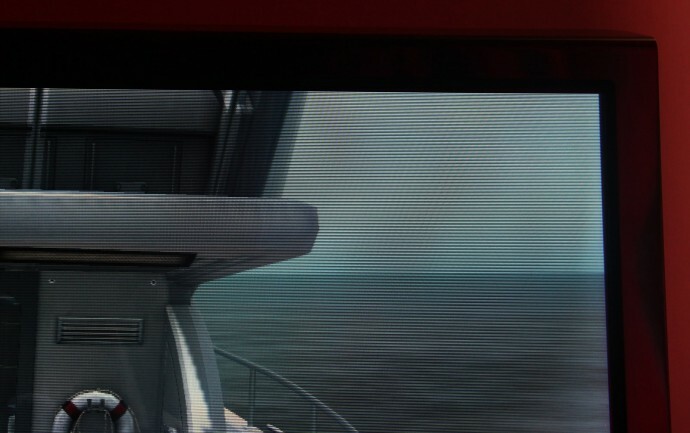 The bottom part has some faint crosstalk visible, but no color ghosting due to the overdrive (something we’re used in seeing with active 3D monitors). So what is the conclusion about the 23-inch Asus VG23AH passive 3D IPS monitor? A very good IPS monitor for use in 2D mode and very well performing in stereo 3D mode passive 3D display, not to mention that it comes with quite attractive price for a monitor with an IPS panel and 3D features. If you don’t have a license for iZ3D or TriDef 3D you’d probably have to add in the expense for getting one as there isn’t one bundled, but you’ll need that only if you plan on playing games in stereo 3D mode on it. And if you are not bothered by the fact that you are limited to 60Hz in 2D mode and you have only half vertical resolution when you are using the display in stereo 3D mode, then you might as well go for the Asus VG23AH instead of a more expensive active 3D monitor. It is a bit of a shame that this monitor did not get into the “Optimized for GeForce” Nvidia program as it would’ve made it an almost perfect solution for stereoscopic 3D use out of the box, but still Asus did a surprisingly good job with this product. So if you are considering to go for a passive 3D monitor you’d probably want to put the Asus VG23AH among the top models in the list of possible candidates.